St. George’s has long had a heart for service. Whether it was outreach to airmen in the early years of Scott Field or support for missionaries or nearly 30 years of involvement in Meals on Wheels, our parishioners want to make a difference. Our relationship with St. Mark Lutheran Church, a congregation of deep social commitment, has strengthened and expanded our own conviction and provided new opportunities for shared effort. In 1987, when we began assessing the physical plant and exploring options for expansion, the vestry and the parish as a whole made an intentional decision to stay in downtown Belleville, because we believe it is where God calls us to be and to work for His kingdom. This commission arranges for St. George’s to focus on particular ministries each month of the year. From collecting items for the Violence Prevention Program and Bethany Place, to donating to support FNCA’s summer day camp, to buying Christmas gifts for approximately 100 children who are less fortunate than ourselves, they always have two or three special projects going on and do a wonderful job of keeping the congregation aware and involved. The largest food pantry in Belleville, this joint ministry with St. Mark Lutheran Church assisted over 900 families (and over 2800 individuals) during the year 2000. Volunteers help bag and distribute food to the needy from 9 a.m. until noon Tuesdays through Thursdays. It is a part of the St. Clair County “Call for Help” program and a member of the St. Louis Area Regional Food Bank. Volunteers are always needed and always welcome. 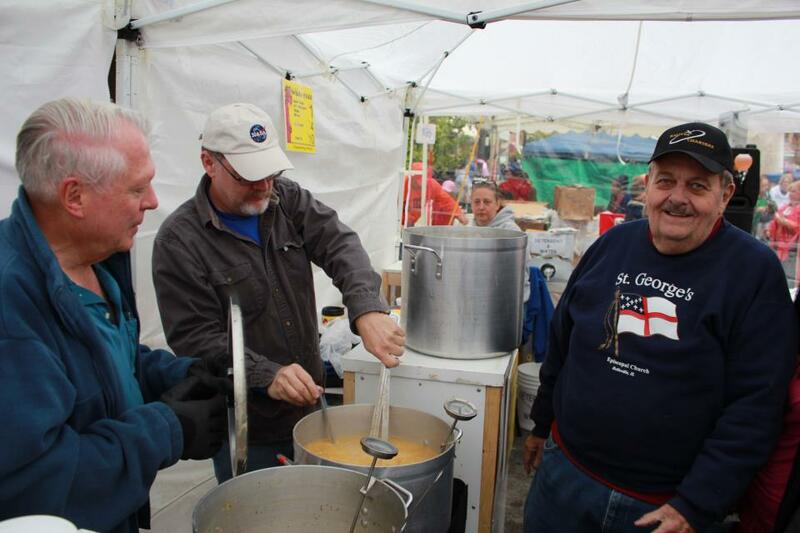 St. George’s participates in Belleville’s Chili Cookoff competition held every October. Each of the last five years the Franklin Neighborhood Association (FNA) has been asked to work with St. George’s and in return has received the net proceeds from this event. Over $2,000 has been raised for the FJNA over the last two years. In 2000 St. George’s received the First Place Blue Ribbon for its (in) famous “White Chili.” The Cookoff is a great opportunity for Main Street fun and fellowship. The annual Super Bowl Chili Sale is scheduled for February 5. Click the following for more information. .
St. George’s sponsors Pack 2 of the Boy Scouts. Adult volunteers are welcome and always needed. Contact Julie Herr or the office for more information. Several blood drives are held each year at St. George’s in cooperation with the American Red Cross for both parishioners and the local neighborhood. Contact Frank Rogers for more information. An annual service project during the summer for our youth (and others from the Diocese of Springfield ), Work Week brings young persons and adult sponsors together to scrape and paint houses of elderly and disabled residents.